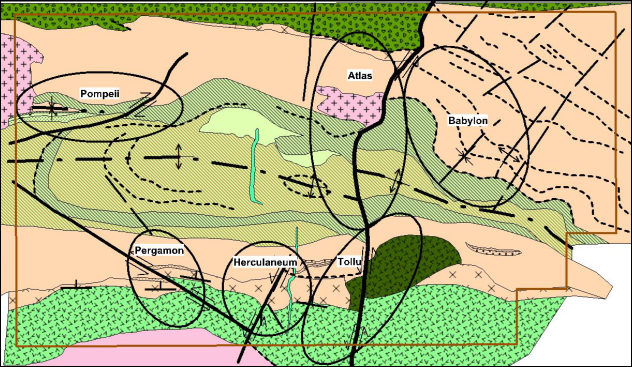 The Atlas Project lies to the immediate north of the Tollu Project and is proximal to the Tollu Fault Zone (Figure 1). Most of the project area appears to be under a thin Tertiary under cover. Importantly, much of the architecture of Tollu is repeated in Atlas. In addition is the inclusion of intermediate volcanic rocks of the Hogarth Formation and the intrusion of a granite (Figure 2). 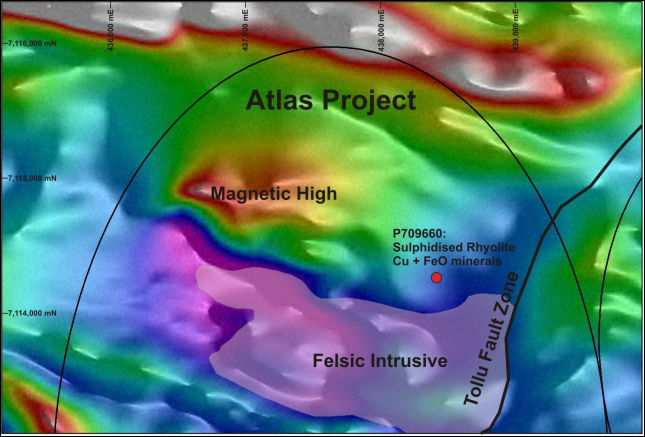 In combination with the proximity of the Tollu Fault Zone, and expanse of Tertiary cover, the Atlas Project is prospective for a blind Mt Isa style-copper sediment-hosted deposit. 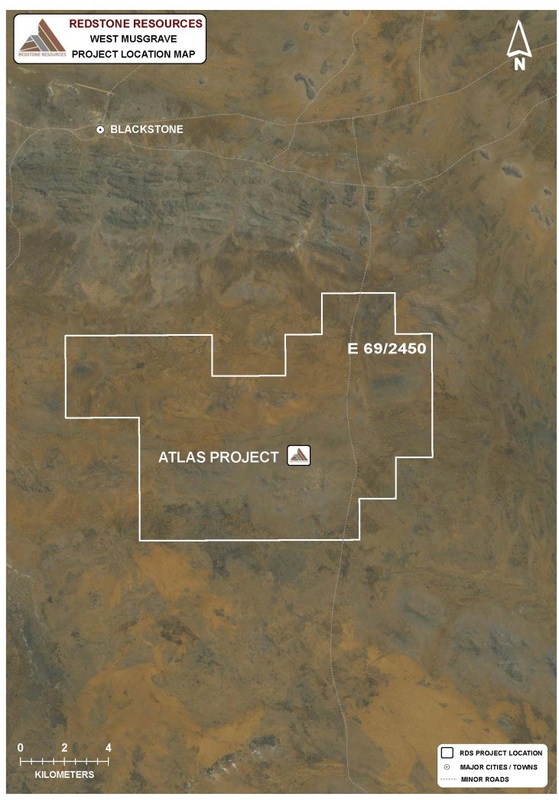 The Atlas project is also prospective for the IOCG mineralisation. In the northern portion of the Project, a felsic intrusion is positioned at the margin to the Tollu Fault Zone. Immediately north of this is a magnetised unit with a strike of 1200 metres and width of 500m (Figure 3). The rock type is interpreted to be a porphyritic rhyolite. As a magnetised feature it could represent a portion of stratigraphy not demagnetised by the Tollu Fault Zone, or the footprint of a hydrothermal cell that caused magnetisation consistent with an IOCG analogy. Adjacent to this location, within the damaged and demagnetised domain of the Tollu Fault Zone is a rock specimen P709660. This specimen was studied by petrographic analysis by Teale and Associates (2006) and was observed to be a porphyritic rhyolite that has been sulphidised. It contained pyrite, chalcopyrite, covellite, magnetite and haematite as accessory minerals. Abundant K-feldspar and biotite was present but it is unclear from the description if these were primary or a product of metasomatism. The observation of pyrite, chalcopyrite, covellite, magnetite and haematite favour an IOCG deposit model. Figure 3 – The spatial proximity of the sulphidised rhyolite as determined from petrographic thin section (2006), a magnetic high, a felsic intrusive and the Tollu Fault Zone.